If you get satisfaction helping kids to excel at math, you'll really like the math games 4 kids on this site. Here’s a super-simple game for early learners. This game asks players compare the lengths and weights of everyday objects. In many cases, players can simply look around the room and find an answer! Preparation: Assemble the spinners as shown below. Choose either the two spinners for length, or the two spinners for weight. The first player spins both spinners. He names an object that meets the criteria and tells the group what it is. Example: The spinners land on “the same as” and “the width of your finger.” The player decides a piece of chalk has about the same width as his fingers. If the group agrees, he earns one point. If the group disagrees, he measures the object, if possible, to determine if he is correct. If he is not correct, he does not earn a point. Play enough rounds so that each player has 4 or 5 turns. The player(s) with the most points win. As players gain expertise with these spinners, make new ones with new pictures. You can also use the same idea to create your own spinners for volume. Show students how to construct the spinner. 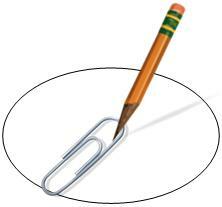 The student can hold the pencil in the center with one hand, and spin the paper clip with the other hand. The outer part of the paper clip can also be bent so that it has a long straight pointer.